All book sales final after the deadline. Must have original store receipt and books must be in the same condition as purchased. Winter Session: up until the add/drop deadline. Refunds can be made within 14 days of purchase. Must not have accessed more than 10% of the material. Must not have printed any pages. Questions about Titan Direct Access Textbooks? Rented textbooks must be refunded on or before the deadlines listed above. The original receipt must accompany the return. Books must be in good condition with minimal wear. All rented titles are due back to Titan Shops by the last day of final exams in the semester they were rented. General books (excludes textbooks and custom packets) and general merchandise may be refunded within 30 days from the date of purchase provided you have a receipt and the product is in the same condition as purchased. CSUF course catalogs and schedules are non-refundable. All calculator sales final. Electronics, other than calculators, may be returned within 14 days from the date of purchase in unused condition and with store receipt. Electronics include batteries, lights, headphones, pencil sharpeners, recording devices, recording media, etc. May be returned up to 30 days from the date of purchase in unused condition with receipt. Credit is available up to 14 days from the original date of purchase. Item(s) must be in new condition and in original packaging. A 15% restocking fee is applied to all opened merchandise. We will not accept open-box refunds, returns, or exchanges for software, ink, toner, and iPods. If defective, you may exchange the product for the same item unless otherwise noted. Titan Shops will not accept the return or exchange of any item if the UPC code has been removed from the packaging. iPods must be current. Textbooks (new, used, rental, and digital) must be returned by the due dates above to receive a refund. Digital books that have been activated can not be returned. Returns may be refunded or exchanged in-person at Titan Shops or the Irvine Center Bookstore. Orders may be returned by mail to the address below using the return form including with your order. When shipping your return, include a copy of the packing list. Please email titanshopsweb@fullerton.edu for assistance. Allow 1 to 3 business days for order processing. Photo ID is required for pick up. Pickup is available at the Main Store at Cal State Fullerton and the Irvine Center Bookstore. Residence Hall pickup is a seasonal option that is available before and during the first week of classes. No shipping fees on back orders. FedEx SmartPost Ground: $7.99 FedEx Ground shipping with final delivery by US Postal Service. This is a good option for PO Box addresses. Allow up to three business days for deliveries within Southern California and up to nine business days for orders outside SoCal. Orders outside the lower 48 states can take longer. 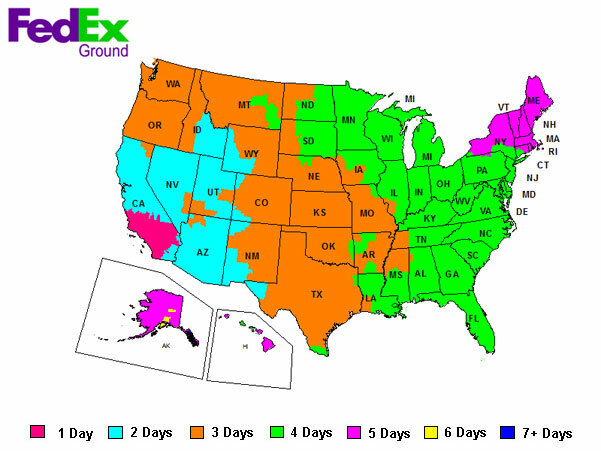 FedEx Ground: $9.99 FedEx Ground shipping delivers to the 50 States in two to seven business days. Allow up to two business days for orders within Southern California. FedEx Signature Required: $13.99 shipping through FedEx Ground. We recommend this service for all residential deliveries. FedEx 2-Day: $15.99 FedEx Second Day shipping to the 50 States. FedEx 1-Day: $30.99 FedEx Next Day shipping to the 50 States. Canada: $31.00 FedEx Ground shipping for all orders to Canada. Read below for taxes, duties, and customs fees. International: $66.00 FedEx International shipping. Read below for taxes, duties and customs fees. Orders to PO Boxes or APO/FPO military addresses will be delivered by US Postal Service. USPS and FedEx or its local country affiliates will charge the recipient all applicable duty, taxes, and/or brokerage fees C.O.D. in the local currency at the time of delivery. All taxes, duties and customs fees are the responsibility of the customer. Tax and duty amount is presented during delivery, not during checkout. Your local post office or carrier can give you information on the methods of payment accepted for the duties, taxes, and other fees collected upon delivery. Allow 1 to 3 business days for processing. All orders ship from Fullerton, CA. For FedEx SmartPost Ground, add an additional two days to the transit time. SmartPost orders are picked up by FedEx and delivered by USPS. Expedited orders will arrive in one or two days after receiving the Order Processed confirmation email. Contact Apple for all support. Every Mac comes with complimentary telephone technical support within 90 days of your Mac purchase and a one-year limited warranty. Every iPod comes with complimentary, single-incident telephone technical support within 90 days of your iPod purchase and a one-year limited warranty. Call Apple complimentary support at (800) 275-2273. Gift cards can be purchased at Titan Shops and the Irvine Center Bookstore. They can be used at Titan Shops, the Irvine Center Bookstore, The Brief and The Yum convenience stores. Gift cards are re-fillable and accepted online. Visitor information can be found at Cal State Fullerton's Parking and Transportation Services.